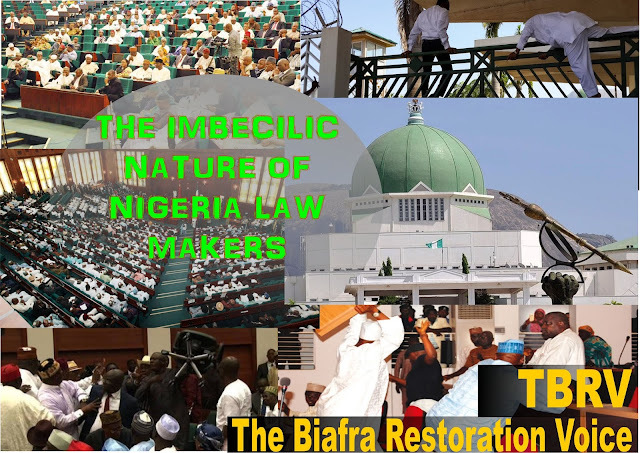 Law makers are the life wire of every civilised country, their duty is to legislate and prosecute issues but not limited to the issues of indictment of high-profile persons including the presidency. But the nonchalant attitude of the so-called law makers towards issues in this damnable entity called Nigeria is raising a dust, more especially the ones bothering on the presidency. Recently there is a speculation almost in every quarter that the person in Aso-rock is a clone. This is a very big indictment on the presidency, and it is expected that by now the law makers would have swung into action to verify the true nature of this allegation, but to my greatest surprise the two chambers are yet to commence any forensic investigation over the allegation, instead what they are after is how to be re-elected into office in 2019. If it were to be in America or any other civilised country, Buhari would have been forced to resign and be investigated. There are too many evidences pointing to the fact that the IPOB supreme leader Mazi Nnamdi Kanu may be right in his claim. What Nigerians needed to know now is the true identity of the man in Aso-rock. The law makers should compel him to provide biometric identification and DNA result as a minimum requirement for re-election to convince Nigerians that he is not a clone. The imbecilic nature of Nigerian law makers are the reason Nigeria still remain under developed and must be dissolved, they have proven beyond doubt that they don't have the interests of the people at heart, they are opportunists who take advantage of their political positions to loot and make public mockery of the already battered image of the zoological republic called Nigeria, if not so how could the two chambers kept mute and pretended as if everything is well in the face of this kind of allegation, the weightiness of the allegation is too heavy and too embarrassing in such that no country in the world would wish it away or sweep it under the carpet. Biafrans deserve a better country, a country where the rule of law will be upheld, a country where law makers will be active and alive in their duty, a country where equal rights and justice will be at home, not a country where a prisoner will be consuming 3.5 million naira per month while workers cannot be paid eighteen thousand naira (18,000) minimum wage per month, not a country where a whopping sum of 200 million dollars will be paid to a man from far away Sudan to impersonate a deceased president because Fulanis want to remain in power, not a country where monkey swallows 70 million naira while the masses are dying of hunger. Not a country where corruption is the order of the day. Biafrans deserve a country free from corruption, a country where the life of the citizens will always be protected, Nigeria as it is today is a lawless entity, what they have as constitution is a memoir of enslavement handed down to them by parasitic Britain through their stooge Abdulsalami Abubakar which they referred to as the 1999 constitution. With this memoir called 1999 constitution Nigeria will continue to remain in darkness as nothing will ever work in her. Nigeria law makers are the most corrupt crop of politicians in the whole world, they are the reason why Nigeria has remained under developed till date, with these crop of politicians Africa is in a grave danger and will continue to remain so till eternity if nothing is done, that is why Biafra remains the only alternative for survival of African continent. In Biafra Africa died but with the restoration of Biafra, Africa will still rise again, therefore support Biafra referendum as you boycott 2019 election.